When I saw Alex Lahey open the main stage Splendour in the Grass in 2016, my friend declared after her set that “the rest is gravy”. After seeing Planet Booty on the first night, it’s my turn to say it. The rest of SXSW is gravy. Stepping into the venue, I walk and then run into the photo pit because the photo opportunities are flying in thick and fast. Planet Booty from Oakland, CA are having some genuine, hair-down, sweaty fun. 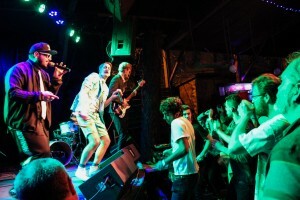 The lead singer Dylan Germick jumps into the crowd to grind and dance with the audience multiple times. A lot of warm fuzzies are tossed around, “It doesn’t matter what you look like…you are something to be celebrated…be a 110% yourself”. If you ever need a pick me up, put a Planet Booty gig on your medication list.